This tutorial reviews the process of creating a new login module on your Joomla website. 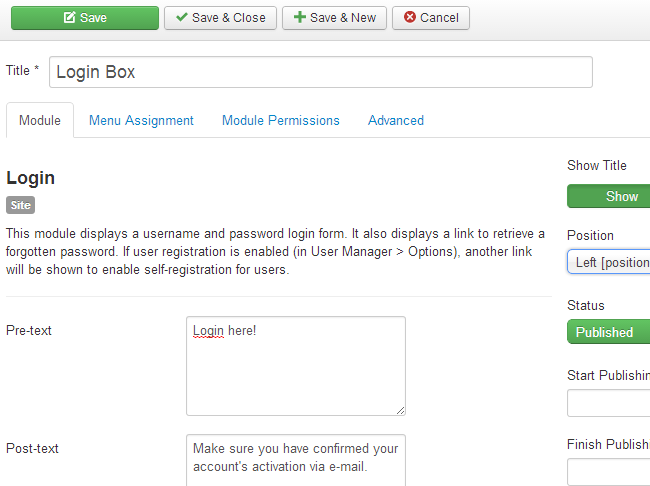 To do that, log into your website as administrator and navigate to the Extensions tab and then Module Manager. Click on the New button at the top-left corner of the screen. Select the Login module type from the list. Title: Enter the title of your new search module. Module: Set the module as published, select template position for it, etc. Menu Assignment: Select the pages where the module should appear. Module Permissions: Set the permissions for the new module. Advanced: Set layout, caching options, tags, etc. When you are ready, click on the Save & Close button to create the Log in module for your website.